Do you ever find yourself searching the internet to find inspiration? I particularly enjoy Houzz, and posts about the newest trends at the High Point market. As you may know, the internet is filled with many great design ideas. It’s impossible to view them all, but sometimes certain things just catch your eye! Wabi-sabi is a decor trend that is based on Japanese philosophies of impermanence and imperfection. In the home, this means emphasizing the use of organic materials, pieces made with innate imperfections, and embracing authenticity, even if that means it's a little off-kilter. Velvet has been growing in popularity for a while (Kate Middleton has even embraced it), and it doesn't seem to be slowing down. The best part is you can use velvet to make a statement (like a gorgeous blue velvet couch) or add a trendy accent with a pillow or throw blanket. Blush: Don't expect blush (pink) to fade in popularity anytime soon. But one thing that is changing: the colors people are pairing with it. Keep your eyes peeled for copper, teal and blue being paired with and heating up this color. Pillar Lanterns: Lanterns have existed for centuries! However, sleek, simple ones can be stylish and practical. For autumn, this romantic accessory is popular to warm up the ambiance in the home. Macrame: Fall is all about being outside (pumpkin patches! apple orchards!) and embracing nature, which is why the earthy, boho vibe of macrame is perfect for any outdoor gathering. Instead of embracing this trend with a wall hanging, this trend can be incorporated into a room with a woven chair or table runner! Greenery: Move over, orange: People are veering away from traditional fall colors and instead embracing nature in the form of green plants and leaves. In fact, “greenery” was the 2017 Pantone color of the year. According to the Pantone Institute, it represents refreshment, rejuvenation, and rebirth. Mud Cloth: Shibbouri and indigo-dyed mud cloth has been on trend for the past year, and it's only going to get more popular as we head into the cozy fall season. 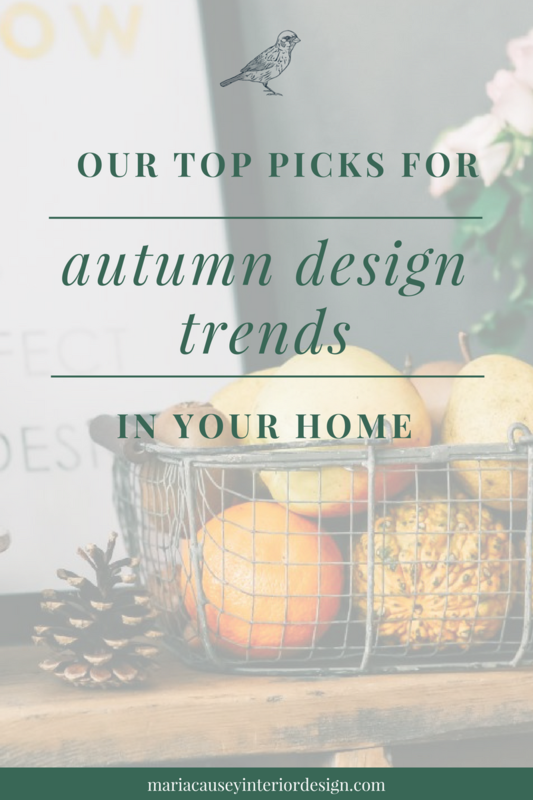 Ready to implement some of these and other exciting design trends in your home? At Maria Causey Interior Design, we always stay well attuned to nuances in design for your home. Since your home should truly reflect who you are and create the mood you desire, we want to help you to make design choices that will last. For more information or to receive a proposal for your next interior design project, please contact Maria Causey Interior Design today.